Amari Cooper: Was 2017 a Fluke or a Sign of Things to Come? With the NFL Draft and free agency having come and gone, we’ll break down all sorts of fantasy-relevant questions entering the 2018 season. Up next is a look at Jon Gruden’s 23-year old No. 1 wide receiver. Cooper likely would have jumped the latter three members in 2017 if not for his wildly disappointing campaign. After racking up 70-plus catches and more than 1,000 yards in each of his first two seasons, Cooper posted just 48 receptions, 680 yards, and seven touchdowns on just 96 targets in 14 games. Part of the problem was simple: According to Pro Football Focus, Cooper has dropped a league-high 32 passes since entering the league. He saw fewer than eight targets in five consecutive games to end 2017 after never having a streak longer than three such games prior, so there’s certainly an argument to me made that Derek Carr is tired of the charade, though Carr attributed Cooper’s rough season to injuries that “a lot of guys probably wouldn’t have played with.” Cooper consistently landed on the Raiders’ injury report due to an ankle injury and later sustained a concussion in Week 12 against the Broncos. Even though Cooper’s seven touchdowns last season were a career-high, he’s probably still due for some positive regression in the red zone; he’s one of just five players with five or fewer touchdowns among the 61 players with at least 30 red-zone targets over the past three seasons. Better health and luck in the red zone would certainly help Cooper’s chances at rebounding in 2018, but the biggest difference might come down to the team’s new head coach and wide receivers. Raiders ownership decided to move on from head coach Jack Del Rio and return control of the team to former head coach Jon Gruden, who didn’t coach a single top-10 scoring offense from 2002 to 2008 with the Buccaneers after doing so in four of six seasons with the Eagles and Raiders before that. Meanwhile, Michael Crabtree has been replaced with Jordy Nelson, and Seth Roberts appears to be on the way out in favor of Martavis Bryant. Nelson and Bryant have different respective skill sets, but since 2016, neither is ranked among the league’s top 80 wide receivers in yards per target among 137 players with at least 50 targets. Per Pro Football Focus, Cooper averaged 2.21 yards per route from the slot last season compared to 1.54 when lined up outside, so the team’s new additions could theoretically boost his snaps from the inside (though it’s possible Nelson is at the stage in his career where he’s best suited for the slot). The Raiders currently boast the league’s third-most expensive offensive line and fourth-most expensive quarterback. They’re positioned to win now and may finally have a clear-cut vision for how to achieve that on the offensive side of the ball. Working as Gruden’s No. 1 wideout has historically been a very fantasy-friendly role: From 1996 to 2008, each of Gruden’s top receivers gained over 1,000 yards with at least five touchdowns, and only once did they have fewer than 111 targets. Overall during Gruden’s 14 seasons with the Eagles, Raiders, and Buccaneers, his top wide receivers converted 137.2 targets per season into averages of 78.6 receptions, 1,142 yards, and 7.4 touchdowns. Gruden and the Raiders might not immediately challenge for the division title, but they’re at least in a good position to compete in 2018 against a schedule that Warren Sharp tabs as the league’s fifth-softest. BetOnline currently has Oakland’s win total set at 8.5 (with a -140 lean on the under). Cooper shouldn’t necessarily be downgraded even if the Raiders struggle to chain some wins together; per our NFL Trends tool, he’s averaged an additional 6.2 DraftKings points per game with a +2.2 Plus/Minus and just 7.0% ownership in 27 career games as an underdog. Cooper’s average draft position as of this writing dubs him as just the WR14 despite the high potential for a career-high target share in 2018. Betting on Cooper in the past has meant betting that his talent would eventually win out over Crabtree’s stranglehold on the offense’s target share; betting on Cooper in 2018 just means betting on how far one of the league’s most talented receivers can fly in his first season as his team’s unquestioned No. 1 receiver. Ed. 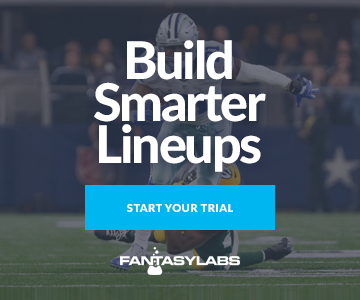 Note: As you may well know, probably no one else on this planet has expressed more love of Cooper’s game over the past few years than FantasyLabs co-founder Peter Jennings, so it would be sacrilegious to publish an article on Cooper without a few words from Peter. When reached for comment, he stated that he’s “hopeful for redemption this year,” but added, “I hope Amari doesn’t take another 10 years off my life due to tilting.” Here’s to a long, long life for Peter.